This was first issued in 2002 as part of Meridian's 25th anniversary. This sensibly coupled disc includes the intensely lyrical yet unrelentingly angst-ridden First Quartet. Its allegedly Bartók-influenced successor is a BBC commission. After a bristlingly driven first movement comes a trudging Marcia lenta - a slow movement cortege with overtones of Shostakovich. The third of the four movements is just as driven but not as thrawn as the first. By contrast the eight minute long finale is designated Epilogo - Molto lento. It provides a pensive summing up in which the sweetly lyrical voice has a touch of innocence. The parallels here are with RVW and Rózsa and the music is ‘sung’ with grace and confidence and ends in a distressed twilight. Only seven years later and Leighton's language has become dissonant. His Seven Variations comprise six short and moody fragments including a wonderfully skeletal pizzicato Allegro molto. The Variations end with a long Adagio e sostenuto which heightens tension and dismay. The hard-won lyrical but shadow-hung heart of the piece sings out at 4:12 in a way that suggests that this Adagio would have been a fitting close to a full-scale string quartet. The disc has somewhat technical notes by the composer, the late Edward Harper, and a very personal eulogy from James MacMillan who had been one of Leighton's counterpoint and orchestration pupils. This is one of a pair of Leighton CDs on Meridian. 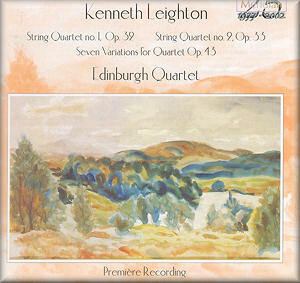 CDE 84465 valuably contributes the Edinburgh Quartet and Robert Markham in Leighton's Piano Trio, Piano Quartet and Piano Quintet. These are premiere recordings as are those on the present disc. In all the attention quite aptly concentrated on the Chandos Leighton orchestral series these two discs must not be overlooked. These are impassioned performances of works steeped in a synthesis of angst and melody.